Discover one of the world's most exciting bullion coin releases, the 2017 1/4 oz Gold Griffin. The mythical griffin, a symbol of strength, wisdom and vigilance is the subject of the second coin in The Royal Mint's exclusive Queen's Beasts series. Struck from fine .9999 gold (24 carat),this unique coin is valued for its exceptional purity as well as for its intricate and beautiful design features. When HM Queen Elizabeth II was crowned at Westminster Abbey in 1953, sculptor James Woodford RA created 10 statues of the legendary beasts that are the Monarchy's heraldic symbols. These figures were inspired by the King's Beasts of Henry V11 that still stand on the moat bridge at Hampton Court Palace. The Griffin of Edward III, as it is known, is one of the most important of these ancient and legendary creatures. The lion is the king of beasts and the eagle the most powerful of all birds. Half eagle, half lion, the griffin is believed to be particularly powerful and regal. Artist Jody Clark has chosen to portray the Griffin of Edward III with wings extended atop a heraldic shield showing the Round Tower of Windsor Castle for the 2017 Gold Griffin 1/4 oz bullion coin. Why buy Gold Griffin 1/4 oz at coininvest.com? Fractional Gold coins are ideal for new or young collectors or for investors who wish to diversify their portfolios with fine gold. 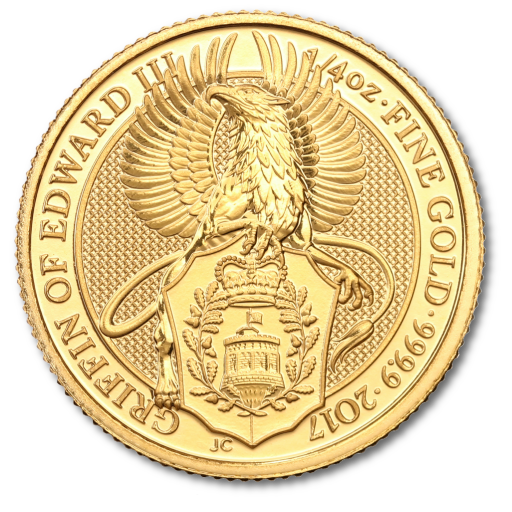 This 1/4 oz Gold Griffin has the added attraction of being part of one of the most eagerly anticipated series' produced by the prestigious Royal Mint in LLantistrant, Wales. 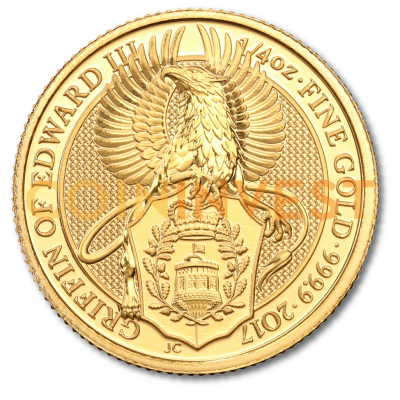 coininvest.com is pleased to present the 1/4 oz Gold Griffin 2017. These exclusive bullion coins can be purchased in multiples of 25 in tubes or in monster boxes of 500. All orders are shipped quickly to your preferred address. the 1/4 lion coin has increased in price already so i bought the gold griffin to participate in this price move. fingers crossed!